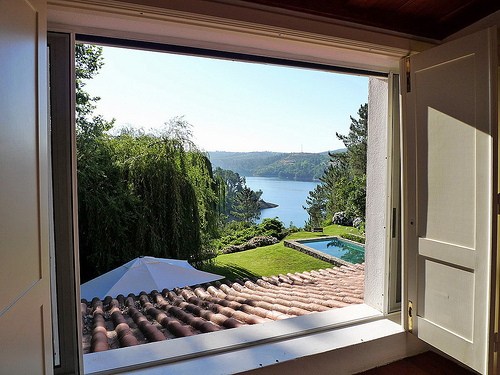 Quinta do Troviscal is a small and quirky guesthouse located right on the banks of the Castelo de Bode Lake, close to the historic town of Tomar in central Portugal. 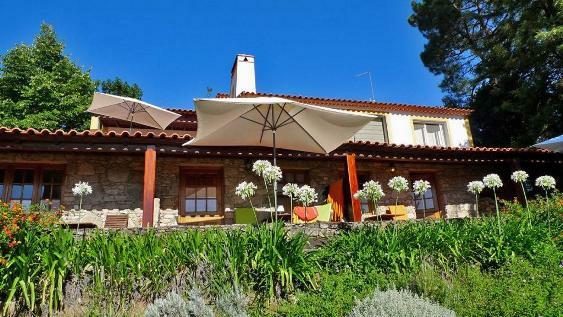 It offers just two bedrooms and one suite ensuring guests enjoy the feeling of being in a home from home, like private residents in a traditional Portuguese country house. 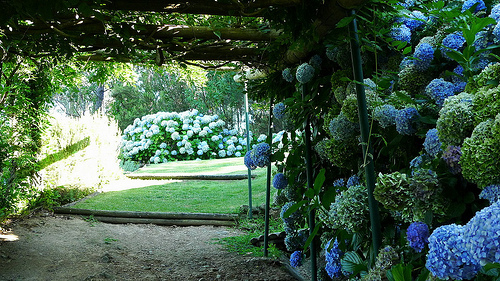 It is the ideal location for couples looking for peace and quiet in a romantic setting, or for a small group wishing to rent all three rooms and have exclusive use of the property. 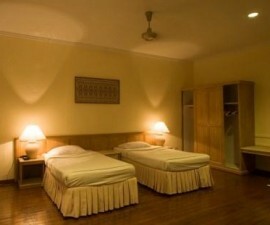 The rooms are clean and comfortably furnished with en-suite facilities and great showers. 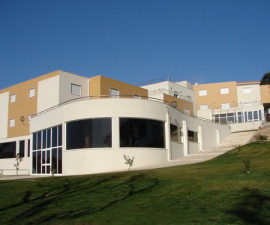 Vera Castel-Branco, the owner, is relaxed and friendly with the attitude that nothing is too much trouble, which really adds to the charm of ones experience at the Quinta do Troviscal. 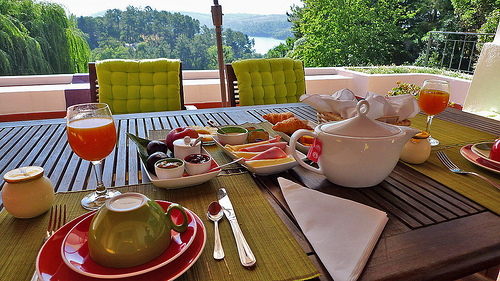 Breakfast is included in the room rate and is served on the private terrace of each room, making for a lovely start to the day before heading out to explore nearby Tomar and the surrounding area. The continental style breakfast includes home made cakes, yogurt, fresh fruit juice, breads, cheese and cold meats. 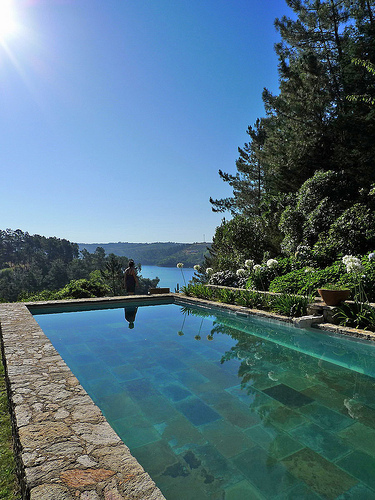 The house is set in private gardens surrounded by lush greenery and giving directly onto the Castelo de Bode lake. There is a private open-air pool for guests to use and the lake itself offers plenty of bathing and water sport activities. 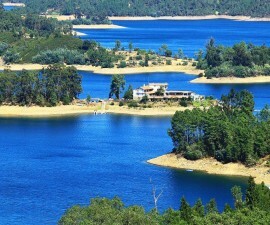 Castelo de Bode is the largest freshwater lake in Portugal and is a favourite place for local residents to congregate at weekends to enjoy its fresh waters and relax in the shade of the eucalyptus trees that rise from its banks. 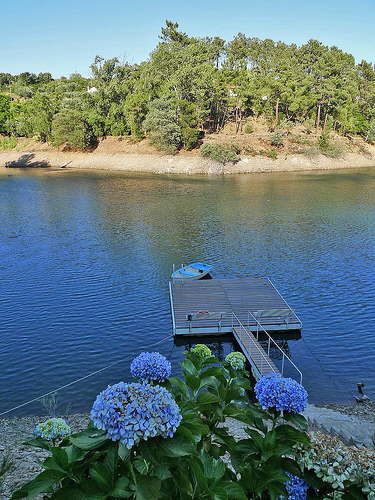 The lake is very popular in summer but its 60-kilometre area ensures that it is never overcrowded. A short walk through the gardens brings you out at a pontoon at the reservoir where the owners have thoughtfully left a rowing boat moored for the use of their guests. Elsewhere on the lake it is possible to organise sailing, canoeing and snorkelling and the owners are happy to provide assistance with directions or making bookings. 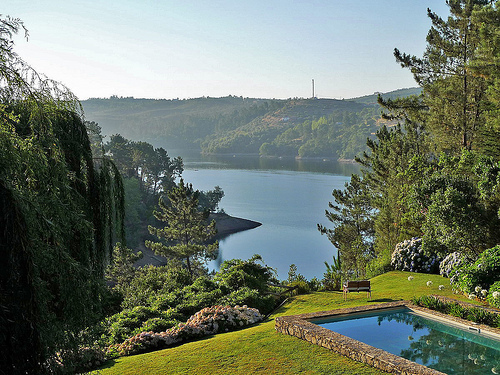 Tomar is one of Portugal’s most attractive cities and home to some of the country’s most important national monuments. If you can tear yourself away from the relaxation of Quinta do Troviscal, head to Tomar to explore the UNESCO site by day and enjoy some excellent regional cookery in its restaurants by night.